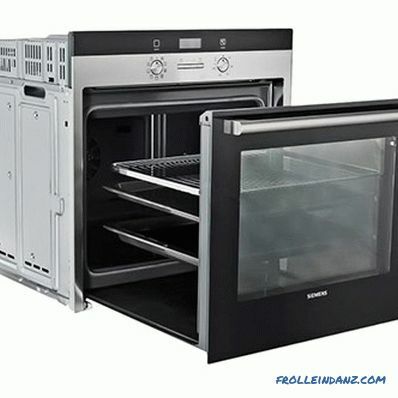 All ovens, dependent and independent, built-in and free-standing, are divided into electric and gas. And it is precisely the difference in the source of energy that is paramount, it is with this that one should begin his choice. A large proportion of ovens produced today is accounted for by electric models, and recently there has been a tendency for its further growth. The proposal, as you know, is determined primarily by demand: those who want to purchase a gas oven really are less and less. Does this mean that gas ovens are worse, or is the rise in popularity of electric ovens just a trend of fashion? Let's try to figure out which oven is better - gas or electric, which the modern market offers us, rather than being guided by the choice. Mistresses regularly use the oven, but most of them do not even think about the principles of its operation. Modern ovens are overgrown with a mass of functions in comparison with the models of half a century ago, but in general, their device has become only slightly more complicated. 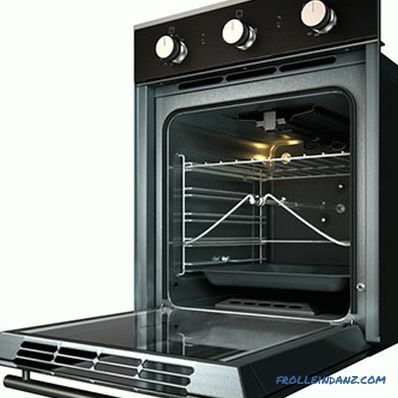 Any oven is, above all, a metal cabinet with ventilation holes, inside of which is located a working chamber. The space between the chamber and the walls of the cabinet is filled with a heat insulator, which helps to reduce heat loss, and hence the energy consumption for heating. 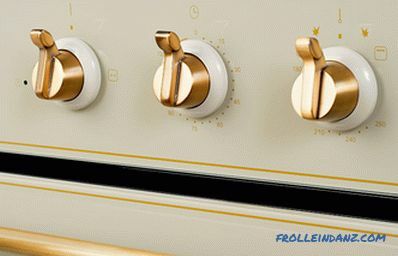 The action of any ovens is based on contactless heat transfer from the heating element to the processed product, as a result of which the latter is heated to a temperature of from 30 to 250-280 ° C. TENs (in the case of electric ovens) or open flame (in the case of gas-fired ovens) can act as a source of heat. All ovens differ in the number and type of heaters - they can be placed only at the bottom or bottom and top of the cooking chamber, and sometimes on the back wall, next to the convection fan. The gas oven runs on combustible gas, either trunk or bottled. By adjusting the flow of gas that enters the burner, you can change the size of the flame. Passing through the burner nozzle, the gas is mixed with air. The resulting mixture after exiting through the side openings of the burner ignites. Ignition of a flame in modern gas ovens is made by means of the built-in electric piezo-igniter. For the normal functioning of the gas oven requires a constant flow of air. There are, however, technical limitations on the installation of electrical ovens. We are talking about a possible discrepancy between the power consumption of the device and the capabilities of the power grid. Another three or four decades ago, the number of household appliances was not the same as it is now, and their total power consumption is not comparable with today's. 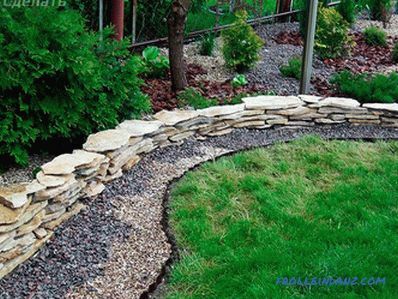 Therefore, the electrical networks in homes built in the last century, designed for completely different loads. Installing a powerful electrical appliance in an old housing house, such as a modern electric oven, may require replacing the wiring (however, replacing electrical wiring in a separate apartment does not always solve the problem due to insufficient external power networks). When you start to decide whether it is better to use a gas or electric oven, make sure you have the technical capabilities to install both. To achieve a given degree of readiness of different products, different temperatures and heating rates are required. The more heating modes at the oven, the more varied the list of dishes that you can cook. Low-cost electric ovens are equipped with upper and lower heating elements (heating elements), which can be switched on separately or simultaneously. Sometimes under the "ceiling" of the working chamber there is another additional heating element, at the maximum heating, the red-hot one is a grill. 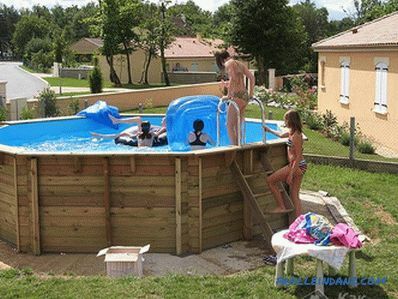 The more expensive models, in addition to the classical heating modes, also have convection. 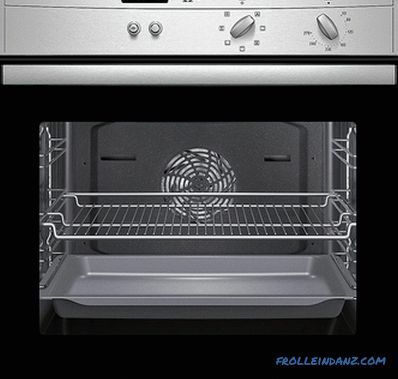 Convection - forced air circulation with the help of a built-in fan for redistributing heated air over the entire working chamber area of ​​the oven - helps to ensure even baking of food from all sides and forget about the burnt top and raw buns inside. The heating of the working chamber in a low-cost gas oven is unidirectional. The heat is created here only by the gas burner located below. However, despite this, the gas oven, as a rule, exceeds the electric one in heating rate. 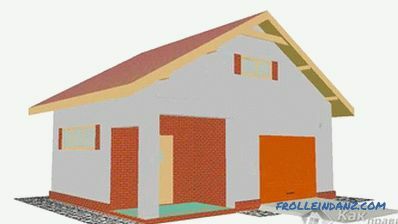 In models of the middle price segment, in addition to this, there is also a grill, which can be either gas or electric (ovens with electric grills are essentially not gas, but gas-electric ). Gas oven with electric grill and convection heating. The gas grill is more difficult to use, but can significantly improve the taste of the dish. Many manufacturers began to equip their gas ovens with convection fans, which ensure the forced circulation of air in the cooking chamber, which is necessary for a quick and uniform heating of the prepared product. Around such a fan there is no heating element, as in electric ovens, it simply mixes the air warmed by the lower burner. In electric ovens there are more heating modes than in gas ovens, although with the development of technology their capabilities are increasingly compared. When comparing the functionality of modern electric and gas ovens, the former benefit noticeably. 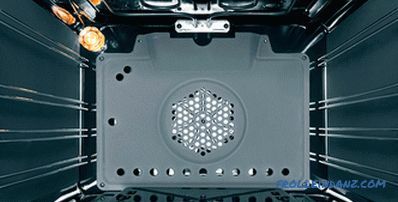 In addition to several basic heating modes, it is often possible to find additional thermal modes ("Gentle Defrost", "Fast Warming Up", "Keeping the Finished Dish Warm", "Tomorrow", "Fermentation", etc. ), as well pair or combination with a microwave. The smart timer can be programmed to turn on or off at the right time. The probe does not just measure the temperature inside the baked product, but sends a signal of its readiness. 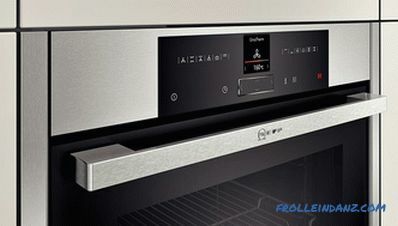 The built-in auto-cooking program of various dishes can even make an actual chef from an inexperienced hostess. It is not surprising that many cooks, even in the gasified kitchen, prefer to have an electric oven, which provides more opportunities for creativity. The functionality of the gas ovens still remains much poorer than the capabilities of their electric “brothers”. 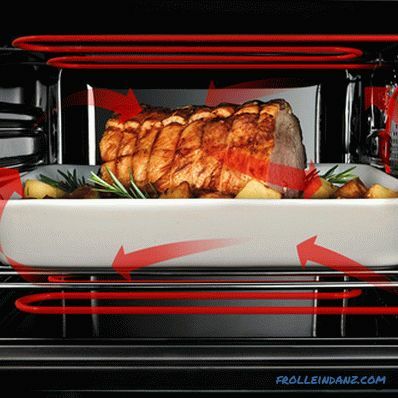 The mechanical control of a gas oven doesn’t cause particular difficulties even for those users who use any equipment exclusively for “you”; disable it almost impossible. 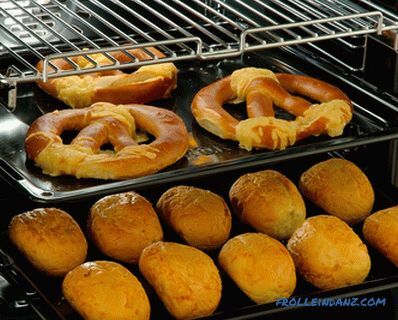 The control of the electric oven can be implemented in two ways - electromechanical or electronic. The electromechanical control unit is simpler and more reliable, while the electronic control gives the user much more possibilities, making the oven not just a kitchen appliance, but an intelligent home appliance. It is impossible to say which of these three options is better or worse - it all depends on your personal preferences. The main drawback of Soviet-era gas ovens was the difficulty of ignition. Having spent a box of matches and at the same time having failed to ignite the flame, the owner of this miracle sighed heavily, recalling with envy the electric oven that he had seen from a neighbor. Today we are spared from such problems. Almost all modern gas ovens are equipped with electric ignition with manual or automatic switching. When you turn the gas regulator inside the burner, an electric spark jumps out that ignites the gas. This happens either as a result of you pressing the ignition button, or in automatic mode. 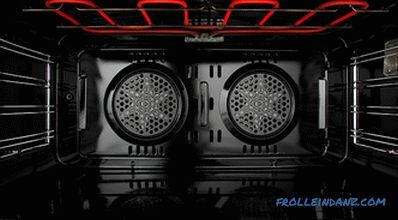 Electric ignition allows you to completely forget about the matches, which greatly simplifies the use of the oven. 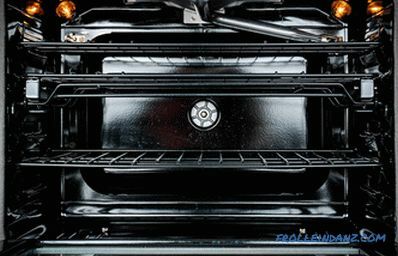 The answer to the question of whether a gas or electric oven is better from the point of view of usability depends on what you put into the concept of convenience — the available simplicity or the maximum introduction of modern technologies. It is traditionally considered that the open flame is more noble than electric heaters, that dishes cooked on fire have a special taste and aroma. Recently, however, the preferences of housewives are clearly on the side of electric ovens. In them, heating elements distributed over the entire area of ​​the device ensure uniform heating of the product from all sides. But in gas, it is much more difficult to achieve even baking. Professionals manage to get good results in gas ovens, but, apparently, this is a result of their many years of experience and skill - each gas oven has its own character, usually extremely harmful. Nobody will give an objective answer to the question of what kind of oven tastes better, because taste is an individual concept.But to achieve uniform product baking and reproducibility of results in electric ovens is much easier. Popular wisdom says: "Do you like tasty food, love and launder the oven". Maybe the proverb quoted is not quite right, but the essence does not change: the oven walls must be periodically cleaned of accumulated dirt. It is better to do this after each use, because, firstly, rare cleaning of the place for cooking is simply unhygienic, and secondly, it is much easier to remove fresh dirt. Owners of cheap ovens, both electric and gas, will have to manually clean the walls. Increasingly, there are models with the EcoClear cleaning system: the fat practically does not stick to the special "bioceramic" wall covering in such ovens, which means that the cleaning procedure becomes less laborious. In more expensive units, manufacturers have provided automatic cleaning. Two self-cleaning methods are used for the oven walls - catalytic and pyrolytic. The technology of catalytic decomposition of fat and other contaminants directly during the cooking process on the catalyst, applied to the enamel, with which the walls are covered, can be implemented both in electric and in gas ovens. But pyrolysis, i.e., burning of residual products at 500 ° C, is possible only in electric models, since using a gas burner it is almost impossible to heat the walls to the required temperature. 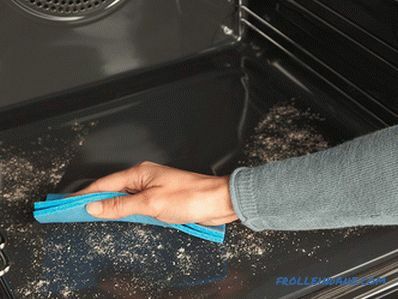 Pyrolytic cleaning method is considered the most effective, but the oven in which it is used, the most expensive. The owners of most gas ovens will have to clean the cooking chamber manually, using a sponge and detergent. Electric ovens have more opportunities to make life easier for their owners. The main disadvantage of electric ovens are high operating costs. Indeed, according to this parameter, they lose to gas “brothers”: electricity is more expensive for consumers than main gas. However, many residents of gasified houses and apartments prefer to install electric ovens in their kitchens. What is the reason for such negligence? Let's try to assess how expensive the use of electric ovens. The oven is still not a hob and is not used every day. Most housewives bake or roast something at best once or twice a week, or even less. 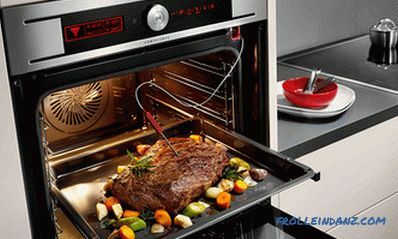 The oven power is 2-3 kW, the average cooking time in it is less than 2 hours. Multiplying all these figures, we will understand that with today's electricity tariffs, your costs are unlikely to exceed a hundred rubles a month. If the gas is paid by the meter, the amount of savings will be completely ghostly. Whether it is worth sacrificing convenience for the sake of this economy is up to you. Using a gas oven is cheaper than using an electric oven. You can estimate the amount of savings yourself based on the expected frequency of use of the device, as well as the cost of electricity and gas in your area. No freshly baked pies or grilled chicken would be a joy if you are constantly haunted by the thought of the potential danger of the unit with which you prepared them. Which oven is better - electric or gas - in terms of safety? The word "gas" is strongly associated with the word "danger". Indeed, a gas leak can lead to such fatal consequences as poisoning of people in the room or an explosion. 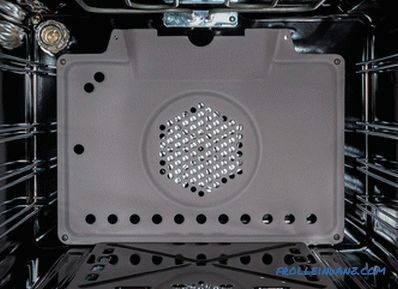 To minimize the risk, all modern imported gas-fired ovens are necessarily equipped with a gas control function: if the flame dies out accidentally (caused by a strong air flow or spilled liquid), the gas supply will be automatically shut off. In some models, with the extinction of the fire, the gas supply does not stop, but the automatic ignition works. The result of both variations is the same - the probability of gas leakage into the room is negated. 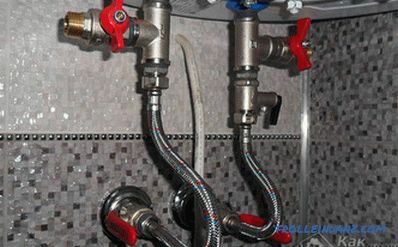 Safety depends not only on the design of the oven, but also on the correctness of its connection to the gas main: only a specialist should perform this work. Recall also that the functioning of the gas oven produces combustion products, including carbon monoxide. So that it does not accumulate indoors in concentrations that are dangerous to human health, care should be taken to ensure good air circulation and at the same time acquire an extractor hood with the oven. On the other hand, electric ovens also pose a certain danger - this is the likelihood of fire due to overheating, and the risk of an electric shock to the user. 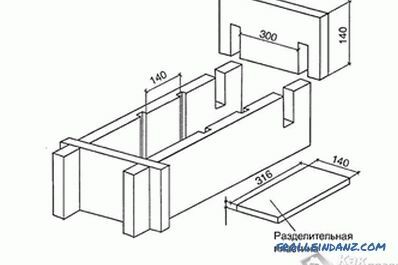 To prevent the risk of fire of furniture and other items in the immediate vicinity of the oven, temperature sensors are installed on its outer walls. When the walls are heated above a predetermined limit (as a rule, it is 90 ° C), they turn off the power supply to the device. In addition to this, tangential cooling is used — cold air blowing the outer walls of the oven. Protective tripping will help protect a person from electric shock: if a malfunction occurs, the electronics de-energize the device. 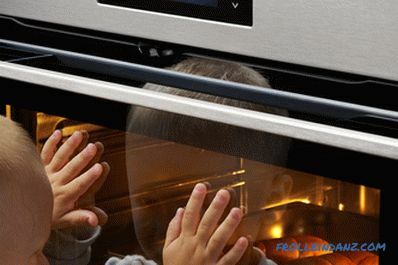 It should be remembered that the safety of using electric ovens depends not only on the manufacturer of the equipment, but also on the correctness of its connection to the power grid. If you do not know what is the power consumption, wire size, grounding, etc., then do not do it yourself, but ask a professional electrician for help. The explosion and fire hazard of gas ovens is higher than electric. However, it should be understood that safety depends primarily on compliance with the rules of installation and operation, i.e., from you. The prices of any household appliances depend on the technical characteristics, functionality, energy efficiency, usability, attractive appearance, as well as the novelty and popularity of a particular model and, of course same, the prestige of the brand. It would seem that gas ovens should be substantially cheaper than electric, because they only benefit by the value of secondary operating costs, in this case the cost of the energy source. However, in practice, we see the opposite: the average gas oven costs about one and a half times more expensive than a similar electric one. Apparently, in this case, the factor of smaller representation on the market affects: gas is released an order of magnitude less than electric. With the same or even superior capabilities, electric ovens are cheaper than gas.